Visual Subst is a small tool that allows you to associate the most accessed directories with virtual drives. It solves three main issues with the built-in 'subst' command: it seamlessly creates drives for elevated applications, adds editable drive labels and restores drives after reboots. Also, Visual Subst makes it easier to create, edit and remove virtual drives in a GUI way. Credit card, PayPal, wire transfer, etc. You can use virtual drives everywhere – it’s so much easier to access files in a project directory you are currently working on using just a single drive letter. Visual Subst provides you with a clean, simple and distraction-free user interface where you can manage all your virtual drives at any time. Generally, a virtual drive is a symbolic link in the local MS-DOS device namespace. It is just one more Windows feature added for backward compatibility with old programs and batch scripts. Unfortunately, there are some significant limitations with the built-in ‘subst’ command under Windows Vista and above. 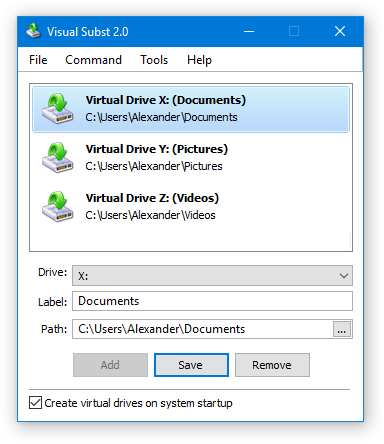 Virtual drives created with ‘subst’ command aren’t visible for elevated applications (if you run a file manager or Command Prompt as administrator, you will realize that apps see these drives differently). You cannot define drive labels – label of the source drive is always used and it cannot be changed. All virtual drives are removed when the user logs off or restarts the computer. UAC and elevated applications: Visual Subst seamlessly creates virtual drives for elevated applications duplicating the drives created for the standard user. It bypasses UAC prompts using the same technique as Hidden Start with /NOUAC switch making no distraction to the user. Virtual drive labels: Drive labels are useful if you often use Windows Explorer. Visual Subst allows you to define and edit virtual drive labels easily. Restoring drives after restart: Visual Subst saves the list of virtual drives and loads it on the system startup. No additional action required – just make sure that “Create virtual drives on system startup” option is enabled. If you run VSubst.exe without parameters, it opens the GUI with the list of current virtual drives. Visual Subst runs only on Windows 10, 8, 7 and Vista (32-bit and 64-bit). The native 64-bit version is included in the setup package and installed automatically.